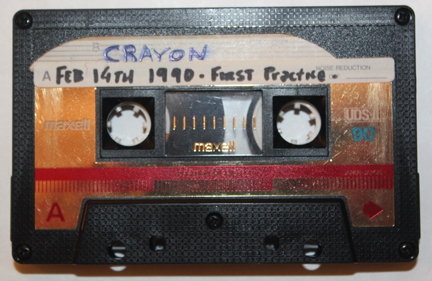 On February 14, 1990 Crayon practiced together for the very first time. Brad took Jeff and I to Griffenshire, a legendary house outside Bellingham owned by Michael Griffen. At the house Michael had a drum set, a few amplifiers and various musical instruments set up and ready to play. He graciously allowed us to make noise on them, and I can’t overstate how much his encouragement meant to us. Jeff took to the drums fairly quickly, while Brad and I were simply awful on the bass and the guitar. That afternoon we attempted to play music together, and with absolutely no idea what we were doing it was a complete mess. Convinced this event would someday be legendary, Brad recorded the entire practice on cassette. Needless to say, this tape is almost unlistenable, but our confidence overshadowed our lack of ability, and on that day we all agreed: “We should start a band!” Eddie Argos would have been proud. Happy Valentine’s Day.